‘Dances with Veils, A Journey to the Divine Feminine’ “After turning the music on, my new teacher turned towards us and began to dance. As she danced, she played a rhythm on a pair of finger cymbals, and they rang quickly and effortlessly. Her hips shimmied as she moved around the room smiling at us, her students, performing for us from her heart and showing us what we had to look forward to learning. I was completely transfixed as well as transported. I felt entranced by her music and by her movements and felt a deep sense of recognition even though this was the first time I’d ever seen a belly dancer, ever heard such sounds, seen such a costume, or such movements. I felt a welling of emotion and felt like I had come home, like everything in my life had led to this moment. It was almost a sense of déjà vu, but more of an inner knowing that I’d found something I didn’t even know I was looking for.” --From Dances with Veils And so, Mezdulene’s journey begins. Educational, entertaining and inspiring, this book is unique and personal, filled with stories of healing, teaching and adventure. It’s about belly dance but more importantly, it’s about sacred femininity and empowerment. ‘The Soul of Belly Dance’ Welcome to the world of Belly Dance. If you are already a dancer, you were drawn to the dance by something, exercise, costuming, a desire to perform or just something you did on a whim. For whatever reason you started dancing, there is something deeper that keeps you dancing. This is ‘the soul of belly dance.’ It’s this deeper aspect of the dance, the history, the culture the feeling inside of us, that seems to get into our blood like a sacred calling that we’ve answered and continue to honor. It’s an unseen force of women dancing throughout the ages and throughout the world, the knowing that we are connected in a time and space continuum to our sister dancers. It’s about a dance that has traveled through time from the ancient to the present, changing and morphing, never limited or bound by societal constraints. In this book, some of the top names in the field of belly dance, as it’s called in the United States, share their research and their experiences, making this manuscript a rich and unique resource for anyone who wants to know more about this beautiful art form. ‘Belly Dance Transformations’ For whatever reason women come to this art form, when it gets into their blood, they can’t help but be transformed. In this book you will read dozens of personal stories about how belly dance has transformed, changed and empowered lives - stories about people overcoming shyness, addiction, low self-esteem and lack of confidence and turning into self-assured and powerful women and men. These stories are touching, encouraging and compelling. ‘Jareeda Jewels Best of Costuming’ The best of belly dance costuming articles of Jareeda Magazine from 2004 to 2008 are now published in a beautiful book for a long-lasting resource for your dance library. Enjoy dozens of articles on all aspects of costuming from research to DIY. In this unique book you find information on how to make a costume for fire dancing to theme dancing to everything traditional. Have you ever wondered about ancient safety pins? Do you like tribal, cabaret or goth styles? These subjects and so much more are contained in over 200 pages of this great publication. ‘Jareeda Cookbook’ This cookbook is filled with delicious Middle Eastern and Mediterranean recipes that will make your mouth water in anticipation. You will find the perfect dish for your next belly dance hafla, that special occasion or family dinner. Inside you’ll find over 80 recipes for appetizers, main courses, desserts and more, plus a great article about chocolate by Jareeda’s food editor, Arzina. 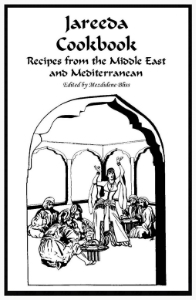 The recipes found in this cookbook come from several sources. Some recipes are authentic down to the last ingredient and received first hand from Middle Eastern friends and relatives, while others are adaptations or originals. Happy Cooking and Happy Eating!